This really is a lovely poem, and I haven’t heard it before. Thank you for the suggestion, Kai. New month, new poem — and an apt one for those of us still recovering from last month’s Snowzilla. Thanks to KaiYves for recommending it and ZNZ for seconding the motion. Does anyone have any good snowy pictures we could use to illustrate it? 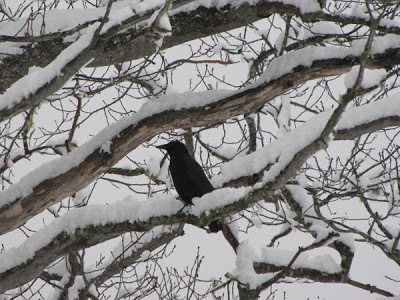 The current crow/snow/tree image is one I grabbed from a Google image search, but I don’t feel good about doing that if there’s a homemade alternative. Happy Feburary! And to all the babies born on leap day this year, Happy Birthday. Because it’ll be your last “real” birthday for a long, long time…. Eh, this last Leap Day Quartet seemed to go by pretty quickly. With such an exotic birthday, you’d think February 29-ers might be more colorful and creative than average. But if you check Wikipedia’s “February 29” page, you’ll find that the famous people born on that day are more or less second-tier. The biggest name I spotted offhand was Jimmy Dorsey, the band leader — not bad, but not quite what I was expecting. Skylab astronaut Jack Lousma was born on Leap Day! Okay, top of the list. This means he flew the space shuttle when he was eleven years old. On this day, February 1st, we remember the crew of the Space Shuttle Columbia, lost while re-entering the Earth’s atmosphere 13 years ago today. That’s one birthday that’s easy to remember. Before I got that straightened out, though, I was telling a friend about this and he commented something to the effect of am I sure doing a course without a prerequisite is a good idea. Since I’d already discussed it with a classmate a year ahead of me but at a similar point in studies, and since then the lecturer gave me the okay, I should be fine, but… I am kind of a masochist, aren’t I? Work/life balance — how does it work?! I’m mildly excited about the coming semester, though. (What the cake else would I be doing with my time if not studying? Being disciplined to turn up to a boring job? (My family members understand the struggle even less than I do.)) But seriously, I am looking forward to it. Today we took our first career assessment. It felt like a personality quiz. Well, wasn’t it? The test is supposed to gauge whether you’re you’re the right “type” of person for different sorts of work. It was supposed to be an assessment that showed what courses and classes we had taken and subjects we have prior knowledge of (at least that’s what it said on about section). Not “What kind of wall decorations do you have in your room”. I like your Aisling avatar, by the way. Aisling is my role model. And my cats middle name is Pangur. I keep typing my old email out of habit. Oops. You know the avatar changing drill. I was going to comment on this too–I adore that movie!! I recognized her when you changed it right away Have you seen Song of the Sea? Yes I have! I seem to prefer animated movies from the other side of the globe as opposed to American animation. I enjoyed “Song of the Sea” as well, but I think I like “Secret of the Kells” more. Yeah, there isn’t much decent animation in America anymore. It’s mostly CGI or outsourced to cheap Asian studios. Good thing other countries have picked up the torch. “Secret of Kells” was great! Ugh, I’m used to ridiculous-sounding conspiracy theories, but “There is someone who looks vaguely like this very much dead famous person with the exact same name so that means they faked their death!” has to take the cake. RIP Edgar Mitchell. I didn’t share all of his views, but I respect what he did on Apollo 14 and throughout the rest of his NASA career. I made pasta tonight and had it with half an avocado. It tasted pretty good, and I saved the other half and the rest of the pasta in a glass container for tomorrow. Today I investigated my mysteriously stubby thumbs (which I thought everyone had until last Friday). I have a harmless condition called “clubbed thumb” that some say is a sign you are a descendant from Europeon royalty. I highly doubt this because it came from Wikepedia. So APPARENTLY for the first time in 25 (26 technically i guess since its almost my birthday?) years, aka the first time in my whole life, I’m watching the stupidsuper bowl. Apparently, it’s a thing that happens now ever since my sister got married because her husband likes football. And since their tv hasn’t gotten good reception for 2 years because their antennae broke, they now watch it at the parents house. And we always spend Sunday afternoons at the parents. Ergo……I am at the parents house and watching Super Bowl. Oh well. Mom is making munchie food and so far there seems to be more commercials than game. Which is good (which is a weird statement to make lol since generally I hate commercials) because I don’t actually understand the rules of football so it’s kinda boring to me. Speaking of Star Wars. There was a moment earlier I could have sworn I heard a couple measures of music that sounded an awful lot like Star Wars theme music…..
All anyone here has tried to explain I me is yellow and red flags. And that Denver player 21 has anger issues. Or a cousin fan, evidently. As a marching band kid, I’ve been to every single home football game at my high school… still don’t understand the rules of football. My family has a traditional Super Bowl party with my grandparents and I don’t mind because there’s food. I just finished my eighth season of going to every football game and I still don’t really understand the rules. – Each team has a side that they are guarding and a side on which they score, like basketball or soccer. – A touchdown is 7 points. This is when one person runs the ball all the way down to the opponents’ field (I believe the line is called the end zone). Once a touchdown has been scored by a team, they have the opportunity to score one more point. This is done by the kicker. I do not know what the point is called. – Each team has 4 tries (downs) to move the ball 10 (?) yards toward their opponents’ side. If they do not succeed, the ball switches teams. If they do, they get another 4 tries to move the ball another 10 yards. – If a team thinks they cannot move the ball far enough with the number of tries they have left, they attempt a field goal. A field goal is worth 3 points. – The game is timed, but they take breaks all the time because they have to figure out how far the ball has moved and then reset to kick the ball down the field again. So really, even though it’s supposed to take an hour (?) it takes waaaay longer than that. So that’s my guide to football. I don’t really watch it ever (I didn’t watch the Super Bowl), so some details might be wrong, but it’s enough for me to follow a game and know when to react appropriately if I happen to be watching a game with friends. Well done! A slight correction: a touchdown is worth six points. But professional teams almost always make the extra point (which is called the “extra point”) for seven. I’m actually vaguely embarrassed by my ignorance at this point, rather than proud of it. I also should’ve spoke more specifically–it’s not so much that I don’t understand the rules, because I knew all of the stuff you said (except the field goal thing which I forget a lot). It’s more that I find it hard to follow–I find it more interesting to talk to my friends in the band than to try to figure out what’s happening on the field. But a number of my friends in the band also really like watching the games, and I respect that too. Were none of you required to play flag or touch football in school? How times have changed. My first game of flag football was in high school during Sports P.E. Most people took the weightlifing P.E. class. I learned the rules of football from my dad, though. He likes watching college football, and I like learning rules to games, so that was a father-daughter bonding moment. I vaguely remember maybe playing something along the lines of flag football in the PE class I was in when I was grade school aged, but I don’t remember anything beyond people had flags tucked in a waist band. And a lot of running. But I has significantly less formal PE time, since I was home schooled, and I think the home school PE class only lasted a couple years or so…..
high school PE I took foundations of physical fitness, which was health class with some running or something like that, walking class where we suited out and walked to the gas station on the corner, bought soda, walked back, and did an independent study individual sports, which was learning the rules to tennis and bowling, taking paper tests on that, and then faking timesheets to make it look like I actually had played games. We played flag football, but never tackle. Now soccer, that we played a lot of. Oh I wish. We played so much dodgeball during junior high that I absolutely loathed it after a short while. And this weird hybrid game that was essentially baseball without a bat. Oh, and basketball, but those games never lasted long because someone always got hurt and for some reason I kept being unfairly accused of fouling people. High school gym class was mainly volleyball and occasionally jogging. Though I do remember one weird game the teacher made up during which I brained someone with a sneaker (this was not the point of the game). I think we stopped playing it after that- I can’t remember the rules for the life of me. Perhaps it was supposed to be field hockey with shoes? Try watching cricket. It only takes a year or two to work out what’s going on. *sighs in relief* I actually managed to get through my whole birthday without people singing happy birthday to me! I don’t like all that attention, though I do do very odd things to get attention. Heh heh…a lot of my posts are pointless rambling or me assuming things to be true when they aren’t. Google’s doodle informs me that today marks the beginning of the Chinese New Year. Happy Year of the Monkey! As it happens, I was monkey-born several cycles ago, so I assume this will be an especially auspicious year for me. I plan to savor each day as I reap the fruits of fortune’s largesse. Happy Year of the Monkey! I am sure Kokopelli will appreciate any excuse to monkey around. Not just the Monkey — the Fire Monkey. That could be interesting. And incendiary. Probably his favorite element, I’d bet. Excellent… I don’t have that strong a positive reaction to monkey, but fire… fire I can work with. To an interesting year! I’m a monkey, too, by virtue of being born in January, even though it was the following year by our calendar. I’m all for taking this to be auspicious. I’m the opposite–I skip being a monkey by virtue of january birthday and am a goat instead! I figured this out for myself in 4th grade so never had an internal crisis over it like some of my january friends did in college and I mentioned the year start date difference to them. I guess I’m the opposite– a rooster, but only by a week or two. I wasn’t all that pleased about monkey, to be honest. But Fire Monkey…well, that’s a whole different barrel! I’m a snake. I was born a month early so I wasn’t supposed to be a snake. XD But, the description of the snake fits me surprisingly well. Happy belated Chinese New Year! I was born in the year of the rat (’96), but my boyfriend was born in the year of the monkey. Rats and monkeys are supposed to be highly compatible, I understand. Yesterday was not a good day, but I did watch the Mystery Science Theater 3000 episode “The Blood Waters of Doctor Z” and had some much-needed laughs. Thank you, reviewers trapped on a satellite, for brightening my day. ProQuest access to digitized historic newspapers is a beautiful thing. Black holes merging! Gravitational waves detected! Exciting physics news! and read my tweets at @rcoontz. My first thought when I heard an announcement was in the offing: Robert must be busy! While everybody waited, NPR science correspondent Geoff Brumfiel tweeted this picture of journalists tweeting. That’s me in the middle, sitting in front of the TV cameras. oh man!! Awesome! 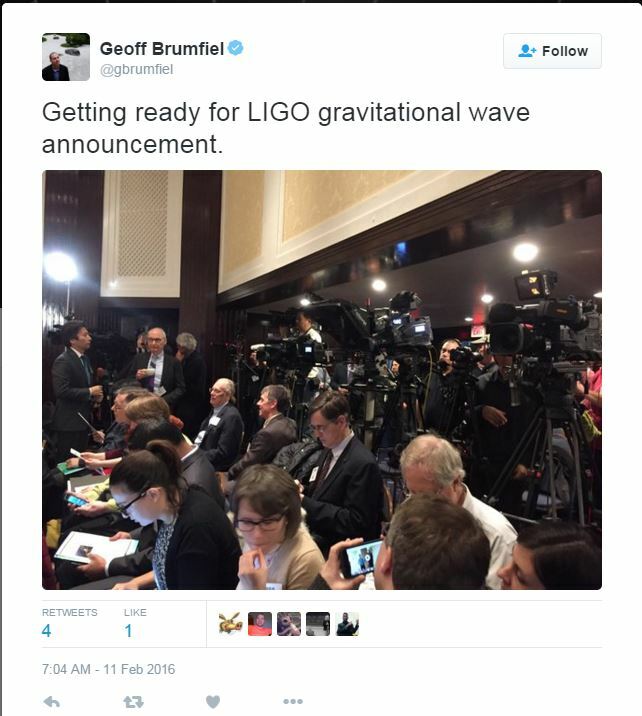 I couldn’t watch the coverage because I was working (on a gov computer, and getting sound to play is near impossible), but as soon as it was time for the announcement I was following the LIGO twitter pretty close!!! I think I was the only one at the office (or at least, in my corner of the office with 5 people, probably people were elsewhere in the building) paying attention but then we all had some excited science chat about it. It’s a brilliant achievement, and amazing technology. Looking for ripples a thousandth the size of a proton by firing lasers over an effective path of thousands of km, then recombining them into an interference pattern. That’s crazy enough, but noise from traffic, seismic moments and hundreds of other sources must be millions of times bigger than the signal they were looking for. And they managed to damp it out all out Astounding. Spilled water on my phone and now the speakers don’t work and I can’t hear any sound and I’m not supposed to plug it in because that could be bad, so I have to go to the Apple Store tomorrow, where I was going to go anyway because I’ve been having problems connecting my computer to WiFi and I think I need to upgrade it to something past Snow Leopard, and the university tech support said they couldn’t help with that. Sound is back, screen is still discolored, still going to go and hopefully get the computer fixed. Another Snow Leopard holdout eh? I finally got around to installing El Capitan, after multiple trips to the Apple store and having to wipe my hard drive (twice)! Hope your upgrade goes better. I miss Snow Leopard….I’m on Mountain Lion, currently, haven’t been able to bring myself to upgrade further, yet. Admittedly in large part due to how cosmetically unappealing later versions are (just like w/ the newer ipod/ipad software). And I’ve heard El Capitan is pretty buggy. I didn’t like the Yosemite UI at first, but it grew on me after a little bit… but I think you’re right about the bugginess of El Capitan. There was an article recently on Hacker News about the decline of the quality of Apple’s software — even reviewers who have historically been in Apple’s corner are starting to pan their software. iTunes especially is extremely buggy, I hear (after getting an Android I converted to Google Play). Upgrade was a pain but I haven’t had any problems since it started working. Seems faster and smoother, and the longer battery life is nice. I’m at the store waiting as it downloads now. I’m probably just going to pick my own background, but it will hopefully fix my problems. I’ve had an iPhone and a Toshiba laptop that runs Windows for a couple years and been really frustrated with the way Apple devices handle music. What are all these Snow Leopard and Yosemite things, and should I look into them? They’re both versions of the Apple OS; you can’t get them anymore because they’re out-of-date. The newest version is El Capitan. So… no? If you’re looking into getting a Mac, it’ll just come with El Capitan. I especially miss the beautiful picture of the snow leopard that filled my monitor every time I turned on the computer. Fortunately, I still see it sometimes. Not a holdout, just bad with computers and thus reluctant to change anything that seems to be working okay– and this has worked okay for six years! I updated and it seems to have worked out, I took the opportunity to get a new background for my laptop– it’s still the Space Shuttle Endeavour, but now on the launchpad against a sunset, instead of the background of it in flight with the lyrics to Rush’s “Mission” that I made a few year ago. My readings for Anthropology of Museums are pretty fascinating, especially the ones with excerpts from the actual writings of the fin-de-siècle people being discussed– there’s one bit talking about how to design mannequins where Franz Boas basically describes the whole idea of the Uncanny Valley in 1896. Wow, thanks! Um, this would be page 589 of the issue for June 17, 1887, and the letter would have continued into page 590. That sounds awesome. I love reading about how people thought in the past, because it gives you a sense of how far we’ve come and therefore how much more must be possible. And what did the guy really say on the second page? I was recently hired for my first-ever job! Starting on the 23rd, I’ll be a page at my local public library. I’m pretty excited. Congratulations, Rosebud! That was my first job, too. Getting paid to hang out in a library seemed to good to be true. Today I put up a mirror that’s pretty big (not as big as a human, but bigger then my cat), and whenever my cat see’s herself in the mirror, she starts scratching at the glass, as if there’s another cat in the mirror. Oh, hello. For those who are confused, yes I still exist here. One thing that’s new, I’ve started a webcomic. It’s really not that good, because I’m not really that good at drawing, and the main characters are stick figures, but it’s a webcomic anyway. I haven’t uploaded yet, because when I do I want to be prepared. Right now, I’m not even past page 6 in the script, but I am still happy with what I have so far. I tried a new art style when I drew the first page, and I really really like it. I love webcomics and I think it’s fantastic that you’re starting one. Best wishes with the project! The heroes arrive in the town and conduct research into the mystery they have come to investigate (supplementing what they have already done at home, of course), including asking about all of the photographs and paintings conveniently hanging on walls that we would normally see only at the end of the episode being panned over while spooky music plays. TV programs would be a lot shorter if KaiYves wrote them. Except for documentaries — they’d be longer. It may be of interest to some people on here that The Verge has an article about giant squids in popular culture. Recently I’ve started German lessons. It’s a language I’d really like to be able to understand (and speak/write), and could be useful if I want to study/live in a German-speaking country at some point. It’s a bit daunting adding another language into the mix (it will be my fifth) – it frankly feels alien to be such a beginner and to know virtually nothing, but hopefully I’ll be able progress quickly! Fifth? That’s awesome! What are your other languages? It’s so frustrating knowing next to nothing and being hardly able to put a sentence together. Soon I hope! But you also have the thrill of that steep, steep, never-to-be-repeated initial learning curve. “Beginners mind” is such fun! This is an alien and enticing outlook that I would love to cultivate. It’d get my over my fear of trying new things, for sure. Novelty is the best policy! Have I taught you nothing? Knowing something is not the same as grokking it. I’m trying to learn, though! More disappointing Google Image Search results: Atlantean passport. So I’m getting my wisdom teeth out tomorrow. Any words of advice? 1) Listen to your dentist and do what they say. 2) When your tongue is numbed, it’s natural to feel like you’re choking on it. You’re not, so don’t freak out. 3) Communicate with your parents by writing or texting while your mouth is still numb unless you can make your “Wa wawa wa”s really expressive. 4) Be prepared to spend a few days doing nothing. 5) Take the pain meds they give you as recommended. 6) Hold ice packs to your cheeks for as long as you can stand. It really does help with the pain. 7) If you want protein and carbs while you still can’t chew, ask your parents to get stelline, a very small pasta, and cook it with meat sauce. You’ll still have to eat very little spoonfuls at a time, but it’s a way to get some variety in your diet besides yogurt and applesauce. Thanks for the advice, KaiYves! I prepared plain ramen with different kinds of soups to add variety. Jello is also great because I don’t like yogurt or applesauce. Just eat things you can ideally swallow hole in the event that you can’t chew. My dentist told me not to eat small things in case they got stuck in the hole, so not rice or small pasta (contrary to Kai’s suggestion). Don’t drink from straws because then you risk dry socket (my mom did not know this and immediately put a straw in a cup of water for me because I was spilling it everywhere). Also, I didn’t take any of the Vicodin they gave me and got by on ibuprofen, so YMMV when it comes to pain meds (but definitely take the FULL course of antibiotics). The anesthetic they initially gave me didn’t make me loopy or anything (everything I said was unintelligible, apparently), but it did give me double vision, which after the car ride home made me nauseous. Just sleep for as long as possible after the surgery. *swallow whole. Choking is kind of a consideration because your mouth will be numb/feeling weird. I was up and about again the next day, though I kept the soft diet for a few days afterward. A week later I was pretty much completely fine. When I was eating the stelline, I could chew a little but not very much, and I was eating it with the front of my mouth and being careful when swallowing not to get it near the holes. Well thanks for the advice, guys! The operation itself went okay (they let me bring my own headphones and listen to music which was nice when I could hear it over the drilling) and had me on laughing gas, which lost its effects as soon as they took me off of it. So I was pretty miserable afterwards (I kept drooling when I was leaving and couldn’t tell my lower lip from my tongue, leaving me to believe that my tongue was hanging or of my mouth) but as soon as I got home I was ok. I can kind of eat now which is cool, but I have to go to school tomorrow which means I can’t have any of the prescribed painkillers (they make me drowsy and I drive) and have to get by on ibuprofen. The part I’m most aggravated about is the fact that I can’t play saxophone or trombone for a while, meaning i have to miss tech week in the musical. Yikes. They’re making you go to school the day after you got your wisdom teeth out? That’s harsh. Nope, I got them out on Friday, so it will have been three days. Hopefully the worst of the pain will have passed by then. I think I would downright refuse to go to school the day after I had them out. My face was so swollen I didn’t want to go out in public at all. There’s a Balrog in my bedroom. To be more accurate, he’s in the entire apartment. Every half an hour to an hour or so, he’ll sound his drums in succession through the stand pipes, just to remind us mere, fragile mortals that he can, at whatever time he chooses, blast through the radiator and drag us to a fiery death with his red-hot whip. I knew I should have named my Build-A-Bear Gandalf instead of Barliman Butterbur. Alas, his lightsaber is several hundred miles away in a box in the basement of our parents’ house. And I don’t think you can Force Pull over hundreds of miles. Have I told you about my friend who has a cosmobear named Furi Babearan? Somebody tell my brain it can’t cross-over a story I haven’t written yet with a video game I’ve never played. It doesn’t matter that they’re both set in 1968 and involve people lost at sea. Am I the only one who isn’t getting ens wisdom teeth pulled? Because it’s starting to seem like there’s some sort of freaky dentist conspiracy going on. I haven’t, I don’t think. How do you know when you’re supposed to? I’ve kept mine! It’s to do with how much room you have in your mouth, I think? I have all of my wisdom teeth, too, thanks to my big mouth jaw. I read once that wisdom tooth removal is the most common unnecessary surgery performed in the US – dentists often push it even if you don’t have any current problems because they’re hard to work on (and it makes money). I still have all of mine. As a contrary viewpoint, I have a very small mouth (seriously, every dentist I’ve ever had has commented on it — “open wider!” “I AM”). I think it was pretty important that I got them out; they were starting to feel very uncomfortable and I could tell even from the one that was just poking out that they would not fit all comfortably. I only have one and it hasn’t caused me any trouble so I’ve kept it. Teeth story incoming! Teeth are always so fun to talk about, I wonder why? I got mine out a couple years ago since the bottom two finally had grown in as far as they could. They were both growing in at ~70 degree angles toward my other teeth, and the dentist said that while that would otherwise be fine, the gap in between them and my other teeth would be really prone to infection. My top wisdom teeth had grown in perfectly, but were starting to overgrow because they had nothing to bite down on. So all four had to come out. Oh, this reminds me, have I ever told y’all my wisdom tooth story? It’s a doozy. content warning, idk, dentists behaving badly? ill-advised medical procedures? so the dentist examined me and said that she thought I ought to have them out, and made a note of it. But then she examined my mother and noticed that she has all of hers (it’s a minor point of pride, she’s also got her tonsils and appendix) and our mouths are arranged exactly the same way. So all concerned agreed that my teeth were fine, except that I had to come back later and have a cavity filled. Now this dentist was the kind of dentist who never explains what she’s doing while she’s doing it, and I don’t have a huge amount of dental knowledge. So when we come back and she’s working on me, I 100% think she’s doing my cavity, except something seems off? And surely she doesn’t need to, like, slice? that much? And then I realize: she forgot to change her notes about my teeth when we decided I didn’t need the wisdom teeth out. She’s trying to take out my tooth. This is the story of how I ended up sitting in a dentist’s chair, anesthetized, screaming “WHA AH OU OO-IN” over and over. But I still have the tooth, so it counts as a victory. I was all fired up to make a comment about Americans encouraging unnecessary procedures… then remembered exactly who I was talking to. (Did you live in the US at some point? Saying that jogged a vague memory.) Ha, I see Lizzie beat me to it. I had the two on the right side pulled when I was 17. They were starting to crowd the others, but my dentist said the others were fine. So I only had half my mouth swollen and painful, and it wasn’t too bad. I never realised that getting a local anaesthetic, y’know, to stop the pain , was itself painful. Oh, we’re only going to stab a large needle multiple times into a very sensitive part of your body. And there were very interesting crunching noises when they dug the mostly-not-out lower tooth out of the gum. And the bits of flesh stuck on the teeth when they offered them to me! That happened to my brother, too. His friends came over afterwards expecting to comfort him while he mostly slept, and instead he beat them at Connect Four and stayed up late watching movies. I grew up on a boat. It’s complicated. But yes, I did live in the US fairly often. Though tbh this wisdom tooth thing is worse in Austria- literally everyone my age I’ve asked has had theirs removed or is going to do so. While I’m sure that it’s necessary in many cases, it did seem a bit excessive. The last time I went to my dentist, she also tried to convince me to get mine out and her arguments were …eh. She said they were unnecessary and that they might cause my other teeth to shift a bit. Admittedly, I have a slightly crooked front tooth that has become even more crooked since my wisdom teeth have come in, but there’s something about applying beauty standards to teeth that brings out my inner fireball. They’re just teeth- it’s not like my parents plan to auction me off like a horse. Not related to wisdom teeth, but based on your comment about applying beauty standards to teeth: I had braces for years as a kid/teenager, and after they came off I eventually got fed up of wearing a retainer every single night since it wasn’t very comfortable, so the bottom teeth especially have shifted and are a tiny bit crooked now. My parents pester me about it from time to time, but honestly it’s not really anything terribly noticeable. Yes, the orthodontic work was expensive but not “wasted”; it fixed the main problem I had as a kid which was a jaw overcrowded with teeth, which did seriously need fixing, so the whole process wasn’t even primarily aesthetic. I guess I should have kept on wearing the retainer for longer (supposedly one is meant to for life? So impractical) – but having only 90% (and not 100%) symmetrical teeth has not impacted my life in any way. I’ve had my braces off for over four years now and still wear my retainer at night- my mouth starts to feel weird if I don’t, and I don’t like my mouth feeling weird when I play wind instruments. I’ve forgotten it on long trips a couple of times and do eventually adjust & it feels normal, but I guess I might as well keep wearing it because orthodontic work is expensive and if my bite starts to slip back my lisp could worsen which would possibly affect my saxophone playing. I got mine out in 2014, I was terrified of the drugs making me act weird in front of my parents, but I was pretty lucid and couldn’t talk because of the gauze in my mouth anyway. Today I watched two men playing chess who were pretty into it, and one of them couldn’t think of any more moves, so he resigned. I pointed out that he still could have captured his opponent’s queen with his rook because they were about four spaces away in the same row. The other guy asked me if I was a chess master. I found this very amusing because I haven’t played chess in years and when I did play chess, I was *horrible* at it. I think the last time I ever won was in elementary school. I do remember how the pieces move, but that’s about as far from being a chess master as knowing how to swim is from being an Olympic swimmer. I made that one up. There’s a lot more where that came from. MBers who have been to Turkey, what were your experiences with regards to female headwear? My dad is convinced I need to buy hijabs even though the female professor whose assistant I’ll be says I won’t need to cover my head, and every travel site I can find says that women are only required to cover their heads in mosques. I thought of getting a head-wrap I had seen at a camping store that was designed to be worn in various ways and has UV-protection and insect repellent, so that I could wear it like a headband or scarf while digging and reposition it to cover my hair if I had the chance to visit a mosque. I haven’t been there, but I would definitely invest in some kind of loose, flow-y scarf if you haven’t already. You may not need to cover your head all the time, but if you’re digging in the hot sun for hours you’ll probably want to. If you buy a wide one, you can also use it as impromptu shawl to cover your shoulders/arms in case they get sunburnt. I have a wide-brimmed that that I wore in Spain when I was digging there, it’s just away from the dig that I’m worried about. KaiYves, Turkey is in principle a secular society, and in cities, at least, my understanding is that you should be able to wear European/American clothes without any problem. In fact, Turkish women in many jobs were not allowed to wear hijabs until 2013 — and you’re a foreigner. I’d avoid skin-baring outfits, though (e.g., no cutoffs and halter tops), and it’s probably not a bad idea to have a head scarf handy if you venture out into the countryside. Try a Google search on “what Turkish women wear” to get the general idea. Those were the travel sites I’d seen, confirming what my professor had said– bring long sleeves and long pants, just lightweight for the summer. I will ask her about the wrap this week if I can make time to see her. I second recommendations for a wide and lightweight scarf or shawl to use to cover your head and shoulders if you feel the need to for sun protection or blending in, but at least in cities you should be totally fine without a head covering. I don’t think you’re the type to wear super revealing things anyway, but midriff-baring outfits and strapless or spaghetti-strap tops are probably ill advised if you’re not sure where you’re going. I’d trust your professor on this one, since she’s presumably actually been there. It’s nice your dad is concerned for you, but he’s not your most reliable source in this case. If you’re working in the field, I definitely recommend going to a thrift store and grabbing a couple white or light colored long-sleeved shirts (I like a button up because they tend to have enough roominess they don’t stick to you like a jersey fabric would) to wear to protect against sun, and a wide-brimmed hat. It may be different at the site you’re working at, or depending on what sort of excavation you’re doing, but often in the field sunglasses make it difficult or impossible to see color changes in soil, so wearing them is sometimes frowned upon. OMG. If Potted Potter (the unofficial Harry Potter parody) comes to your town, and you’re a Harry Potter fan, I absolutely cannot recommend enough that you go and see it. We went today, and it was absolutely unbelievably flamablamablous. I had a total blast, Slytherin won the Quidditch match (we had an amazing Seeker–he was tiny, but man was he determined to get the Snitch). And just words cannot describe the amazingness. It’s laugh out loud (almost constantly) funny, with Potter jokes, current events/pop culture jokes, jokes on just about everything (including location specific jokes–they threw some Alaska ones in presumably just for us as their target audience. Such as the third book, “Harry Potter and the Prisoner of the Alaskan Van). But seriously. It’s is so so so so funny. Wait — you were sorted into Slytherin? Assuming it was anything like the show I went to, ‘sorting’ consisted of “you on the right, you’re Gryffindor, left, Slytherin”. It is a really good show, I went to see it at Thanksgiving. I wish I remembered it better, because there were certainly a couple of gags that were hilarious and we were trying to figure out if they were scripted, and now Luna would be able to confirm whether or not they were and I can’t remember them. Alas. What Errata said: They just split the audience in half down the middle, those on the left of the audience (stage right) were Slytherin, those in the right of the audience (stage let) were Gryffindor. Thanks for the recommendation! It looks like they don’t have any tour dates set beyond Alaska right now, but I’ll try to keep checking back and see if they’re ever coming to my area. GAPAs, it looks like four of my comments got eaten by the spam filter. Could you please investigate why? I have no idea. The filter must be getting trigger-happy. Comments rescued and restored! One of my coworkers mentioned that on his birthday (which was last week, and we were asking how it was) he discovered that he was out of money for food. So, the Trekkie and I made him a couple of sandwiches while we were on our lunch break. However, when we offered him the sandwiches, he got very embarrassed and refused to accept them. We didn’t do this while anyone else was around, but I guess pride can be a big thing. So what now? I don’t want to embarrass him further, but he’s my friend and I don’t want him to starve. He’ll be all right after his next paycheck, won’t he? You could try telling him that you’re just helping to tide him over and that he may buy you chocolate later if he likes. I went to the hardware store to buy a screwdriver that would fit the tiny screws on my solar lamp, because I needed to replace the batteries. The store didn’t have a single screwdriver of the kind I wanted, just a tool with a bunch of small heads with that as one of them. They directed me to their other store, who didn’t have it either, so I just bought the tool with lots of screwdriver heads, because I guess it will be useful to have in general. But the second hardware store was farther up the street it was on than I had been before, and when I was walking back to campus, I found an art gallery that was having this show of amazing landscape paintings. So I spent about an hour in there just looking at them. Happy Birthday, Kai D! Sincerely, Other Kai. And happy 23rd birthday to you, elder Kai. But on a “dark humor” note, I remember someone telling me “that I don’t know how to put on blush”, since the mystery food made my face flush. Ugh, I hope you feel better now. How weird would it seem for a prose story to have the framing device of being a translation of a comic book printed in another language? Hey Robert (or anyone else, I just figured Robert would be most likely to know), is there a post somewhere on the specifics of how the grammar of “en” works? I’m happy to answer any questions about it, of course. Thank you! That’s what I thought was right but there was the Anxiety Voice in the back of my head going “….but what if you’re wrong?”. Speaking of serendipity (see comment 42.1, above), I was just searching for something else when I stumbled across this wondrous MB moment in 2010, when an SSSS almost broke the blog. Do you think it wise to revisit that event? Do you think it’s like the Thing in the Cupboard? I’m taking an awesome Human-Centered Design class this semester, through the Center for Collaborative Creativity at school that I’ve been working at for the past year. We have to submit reflections at several points, and we were specifically told that creativity in medium is encouraged. Tonight, I wrote a reflection in rap form. I don’t think I’ve ever really tried to rap before. I may have been listening to lots of Hamilton recently. I’m quite proud of my rhyming and how fast I managed to deliver it in my video! That though you’ve lived twenty-one years, yet, if we go by birthdays, you’re only five and a little bit over! Happy leap day! I’m just glad I’ve got another day before deadlines of March 1st kick in! I know Fiddler’s met all four GAPAs. Has anyone else? I’ve met Paul and Robert, so I’m halfway there!